A new model of care was developed to provide preventive oral health care for children and young people in the Out of Home Care (OOHC) Health Pathway Program. The model includes a streamlined referral process to public oral health services, a matrix of clinical care and simplified reporting procedures. To ensure 100% of children and young people in the OOHC Health Pathway Program who access public oral health services, have timely access to oral health care and are offered appropriate preventive care, advice and treatment. Ensures all children and young people in the OOHC Health Pathway Program receive preventive oral health care. Improves long-term oral health outcomes and reduces the risk of chronic disease. Increases completion rates of oral health outcome reports. Allows oral health services to focus on providing trauma-informed services. Streamlines the referral service to public oral health services. Simplifies reporting procedures for children and young people in OOHC. Educates children, young people and carers about the importance of preventative oral health care. Children and young people in OOHC come from a background of abuse and trauma. This can lead to poor oral health outcomes and long-term chronic health conditions. Prior to the project, there were no guidelines for the provision of oral health care to children and young people in OOHC. Communication between oral health services and OOHC was also lacking. As a result, there were varying levels of oral health care services delivered in clinics across Southern NSW Local Health District (SNSWLHD) and Murrumbidgee Local Health District (MLHD). There was also little evidence of preventive oral health care provided by dental practitioners, or clarity around what type of preventive care should be provided to this vulnerable group. SNSWLHD was selected as it was effective in engaging the target group, with 93% of children and young people in the OOHC Health Pathway Program accessing public oral health services. This referral model was piloted for one month in MLHD. Evaluation completed and adopted as business as usual. A literature review was undertaken to ascertain best practice in providing preventive oral health care to children and young people in OOHC. A focus group informed the development of clinical guidelines in providing preventive oral health care to the target group. Stakeholder feedback and consultation was undertaken throughout the development of the clinical guidelines, with final endorsement provided by the Oral Health Senior Management Group. 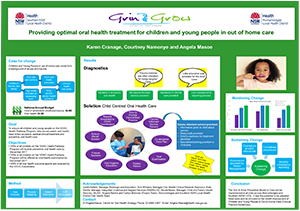 A preventive oral health pack was developed to support and encourage children and young people in OOHC to look after their oral health at home. It included fluoride toothpaste and a toothbrush, as well as general and oral health information. An education session was provided to all oral health therapists in MLHD and SNSWLD on the new model of care. Regular audits were undertaken to monitor compliance with solutions and support clinicians as they implemented the new model of care. Due to the low number of OOHC oral health reports generated by clinicians (33% in MLHD and 57% in SNSWLHD), a root cause analysis was undertaken and it was decided to simplify the reporting template used by clinicians. An Adobe template was developed and trialed at two sites, then implemented in all sites across MLHD and SNSWLHD. Literature reviews and consultation was undertaken with violence prevention and response teams, to identify examples of best practice in trauma-informed services. A stress star (similar to a stress ball) was included in the oral health pack. The stress star gives the child a tactile object to hold while in the treatment chair, to reduce anxiety. An appointment confirmation postcard was developed for children and young people in OOHC. It displays the treatment they will receive when they attend their appointment. This helps prepare the child or young person for their visit and gives them ownership of the process, which is important when recovering from trauma. All public oral health clinics in SNSWLHD and MLHD. The referral pathway was piloted for a month and evaluated in July 2016, before becoming ‘business as usual’. The results of the pilot showed an increase in the uptake of public oral health services in MLHD, from 51% to 65%. number of referrals made from OOHC Health Pathways Program to Oral Health. Geographical distance is a barrier that cannot always be overcome by technology. More face-to-face meetings may have enhanced the project outcomes. Blinkhorn AS. Dental health education: what lessons have we ignored? British Dental Journal 1998; 184(2): 58-59. Masoe AV, Blinkhorn AS, Taylor J et al. Preventive and clinical care provided to adolescents attending public oral health services New South Wales, Australia: a retrospective study. BMC Oral Health 2014; 14(142): 1-9. Merijohn GK, Bader JD, Frantsve-Hawley J et al. Clinical decision support chairside tools for evidence-based dental practice. Journal of Evidence-Based Dental Practices 2008; 8(3): 119-132. NSW Ministry of Health. Health assessment of children and young people in out-of-home care (Clinical Practice Guidelines) (GL2013_010). North Sydney: NSW Health; 2013. Walsh LJ, Brostek AM. Minimum intervention dentistry principles and objectives. Australian Dental Journal 2013; 58(S1): 3-16. Wallerstein N. What is the evidence on effectiveness of empowerment to improve health? Copenhagen, Denmark: WHO Regional Office for Europe’s Health Evidence Network; 2006.